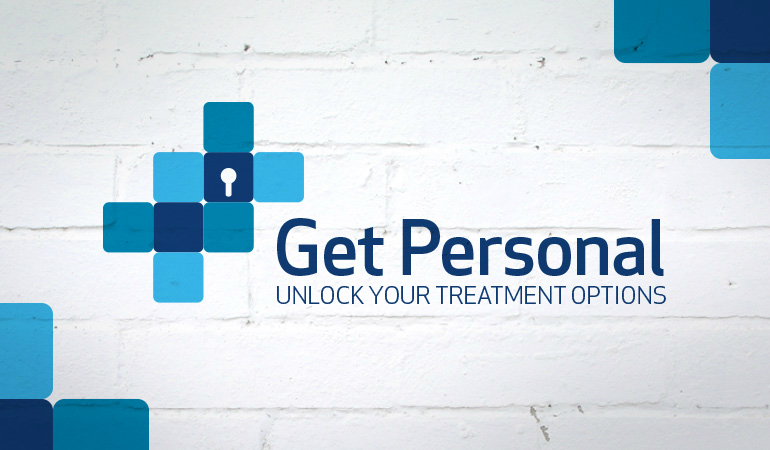 The Get Personal – Unlock Your Treatment Options campaign aims to increase survival rates, improve quality of life and reduce variation in access to best treatment and care for people living with advanced bowel cancer, also known as metastatic colorectal cancer (mCRC), around the world. Advanced bowel cancer is when the cancer has spread from the bowel to another part of the body, most commonly the liver or lungs. Up to half of the estimated 15,000 Australians diagnosed with bowel cancer each year will have advanced disease at diagnosis or will go on to develop it. Each year, there are 1.4 million new cases and 694,000 deaths from bowel cancer globally. Many of these deaths are caused because the disease is detected too late. “The chance of surviving more than five years for someone diagnosed with advanced bowel cancer is around 1 in 10,” said Bowel Cancer Australia CEO, Julien Wiggins. “However, with timely access to effective treatment and high quality care, survival and quality of life improve significantly." “Unfortunately for many patients, access to treatment is dependent on whether they have adequate insurance or if their public health system has approved specific treatments,” Mr Wiggins said. “Furthermore, because people are different and cancers are different, a one-size-fits-all approach to treatment does not always work,” said Mr Wiggins. The Get Personal campaign encourages advanced bowel cancer patients to find out the genetic type of their cancer through biomarker testing, so together with their oncologist they can decide the most effective treatment for them – one that is personalised and targeted. This type of treatment is also known as ‘precision medicine’. “Precision medicine is about delivering the right treatment at the right time, in order to achieve the best possible health outcome and works in a variety of ways,” Mr Wiggins said. Bowel Cancer Australia is working with Bowel Cancer UK, Colon Cancer Alliance (US), Colorectal Cancer Association of Canada, and Fondation A.R.CA.D. (France) to make real change happen for people with advanced bowel cancer. “Campaigning together, we are raising awareness among patients, clinicians and policy-makers about the full range of tests and treatments becoming available and encouraging advanced bowel cancer patients to get personal,” said Mr Wiggins.  For further information, please visit the Get Personal campaign website getpersonal.global. The Get Tested - Unlock Lock Your Treatment Options campaign was a an initiative of the International Colorectal Cancer Association, comprising 14 organisations from around the world and precursor to the Get Personal campaign. RAS biomarker testing was specifically highlighted as an option in advanced (metastatic) bowel cancer that could unlock treatment options, significantly improve personalised targeted patient care and ultimately, improve patient outcomes. "Biomarkers enable oncologists to create personalised, clinically proven treatment plans for patients right from the start in advanced bowel cancer, thereby optimising patients' chances of extended overall survival," said Professor Fortunato Ciardiello, Seconda Università di Napoli, Naples, Italy. "The campaign aims to increase public awareness of the fact that getting a biomarker test done, ideally at the time of initial diagnosis, is vital for patients with advanced bowel cancer to ensure they receive the most appropriate first-line treatment," he concluded. Currently, around 25% of patients with bowel cancer already have an advanced stage of the disease at diagnosis, which makes it challenging to treat successfully. Recent developments in the field of biomarkers now allow specialists to identify those patients who are most likely to benefit from specific treatment options, based on the genetic profile of their tumor. "Biomarkers are reliable clinical indicators that support specialists in their treatment decisions for patients with advanced bowel cancer," said Dr Steven Hildemann, Global Chief Medical Officer and Head of Global Medical and Safety for Merck Serono. An increased understanding of treatment options and greater involvement in decision making about patients own care, together with equality of access to treatments that improve outcomes, are also core principles of the recently launched European Cancer Patient's Bill of Rights. An Australian woman diagnosed with bowel cancer at the age of 28 is the face of an international campaign to improve the current five-year survival rate of just 16 per cent for patients with an advanced form of the disease. 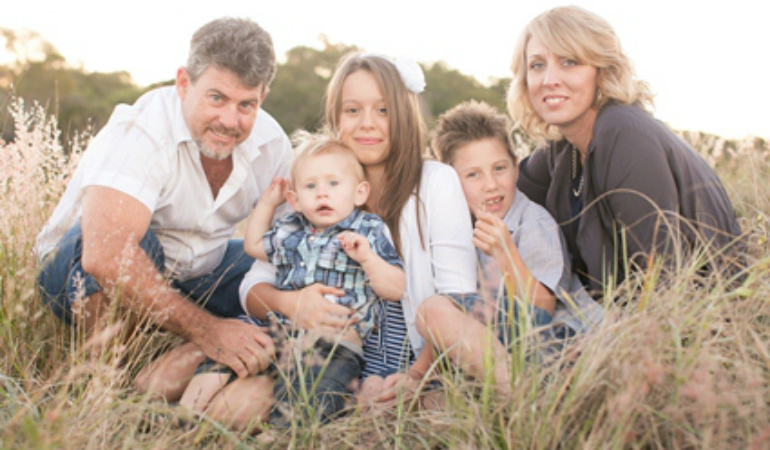 Gladstone (Qld) mother of three Robyn Lindley is sharing her story as part of the global Get Tested campaign. It aims to ensure all advanced bowel cancer patients are offered a genetic test, known as a RAS biomarker test, either at diagnosis or before the start of their medical treatment. More than 15,000 Australians are diagnosed with bowel cancer and of these, nearly one in five have the advanced disease with very few treatment options. Bowel Cancer Australia chief executive Mr Julien Wiggins said a RAS biomarker identifies a patient's gene type and how it is involved in tumour growth, helping both the patient and oncologist make an informed choice regarding treatment. "Around 50 per cent of advanced bowel cancer patients have the normal (wild-type) RAS gene which means they are more likely to respond to certain targeted therapies and not others," he added. Targeted therapies can help improve patient survival rates and cause the tumour to shrink and potentially be removed through surgery. "With Erbitux, Vectibix and Avastin currently on the PBS for advanced bowel cancer, it is increasingly important that patients ask their doctors about a RAS biomarker test," said Mr Wiggins. Robyn, whose cancer spread to her liver within two years of diagnosis, took a biomarker test and was found to have the normal KRAS gene. "Knowing this, my doctor was able to offer a treatment program specifically for me – one that would shut off my cancer's food supply," Ms Lindley said. Eight years on, Robyn is enjoying a healthy, active life and is now the face of the international Get Tested campaign. It involves 14 patient and health organisations including Bowel Cancer Australia who are championing for patients to be tested. "The RAS biomarker test is now available in Australia. Advanced bowel cancer patients need to be aware of it and ask their doctor for it to better inform and tailor their treatment," Mr Wiggins said. RAS testing became accessible in Australia on the Medical Benefits Schedule from January 2015. 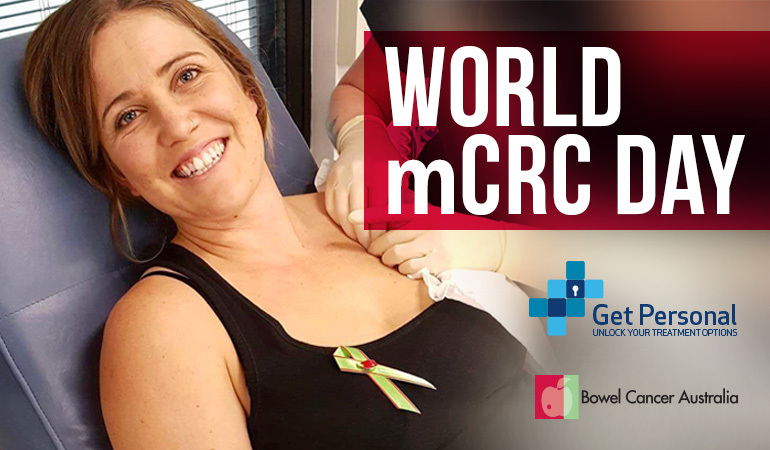 World Metastatic Colorectal Cancer Day held on the last Wednesday of September annually, a day dedicated to raising awareness about advanced bowel cancer, also known as metastatic colorectal cancer (mCRC). Advanced bowel cancer is when the cancer has spread from the bowel to another part of the body, typically the liver or lungs. There are 1.4 million new cases and 694,000 deaths from bowel cancer globally annually. Many of these deaths are caused because the disease is detected too late. The chance of surviving more than five years for someone diagnosed with advanced bowel cancer is 1 in 10. However with timely access to effective treatment and high quality care, survival and quality of life improve significantly. To coincide with World Metastatic Colorectal Cancer Day, Bowel Cancer Australia has partnered with Bowel Cancer UK, Colon Cancer Alliance (US), Colorectal Cancer Association of Canada, and Fondation A.R.CA.D. (France) to launch a global campaign to ‘Get Personal’, and make real change happen for people with advanced bowel cancer. Get Personal aims to increase survival rates, improve quality of life and reduce variation in access to best treatment and care for people living with advanced bowel cancer around the world. We are committed to eliminating variation between and within countries so that everyone, irrespective of where they live, has access to the best treatment and care. Together, and with your help, we intend to put advanced bowel cancer firmly on the agenda of governments, health care providers and key decision-makers around the world, as we campaign for further research to address gaps in knowledge and support the development of new, innovative and effective treatments. By raising awareness among patients, clinicians and policy-makers about the full range of tests and treatments to be made available and campaigning together, we know we can make a difference. Advanced bowel cancer doesn’t recognise borders, and neither do we. For more information on the campaign and to find out how to take part visit the Get Personal website at www.getpersonal.global.